Walter "Shorty" Simms, the H-SC Tigers' most loyal cheerleader and supporter, passed away Thursday, August 31, 2017, at the age of 70. The Hampden-Sydney College community learned with sadness yesterday of the passing of Walter Simms, affectionately known as "Shorty." A longtime resident of Hampden-Sydney, Shorty was for many years a mainstay at Tiger athletic events and on the campus of the college he loved. He was the Tigers' most loyal cheerleader and supporter for many years on the sideline of football games and in the locker rooms of Hampden-Sydney athletic teams. Born with Down syndrome in 1946, Shorty passed away Thursday, August 31, 2017, at the age of 70. "I've always felt that Shorty helped win football games for us," said Head Football Coach Marty Favret, who joined the H-SC football program in 2000. "His spirit and passion for everything we did was contagious amongst my players and staff. He was a true friend and had this amazing ability to help me—a young coach—relax and enjoy the process of game week. He allowed me to put everything in perspective. I'm forever indebted to him for that." Shorty moved to Hampden-Sydney in 1973 with his mother and father, Dr. Gilman Simms '30. Dr. Simms was the College's first athletic trainer, and Shorty became immersed in the world of Hampden-Sydney athletics. After his parents passed away, he continued living on campus for many years with his sister-in-law and brother, Scott Simms '61, until moving into an assisted living facility recently because of his failing health. In addition to cheering on Tiger athletes from the sidelines, Shorty offered physical support as well, helping the grounds crew line H-SC athletic fields and prepare the football stadium for games. At different times, he could also be found re-painting the walls in the former Gammon Gymnasium, washing uniforms in the football locker room, or lending a helping hand in the campus post office. "I will miss my buddy dearly," said Director of Admissions Jason Ferguson '96. "One of Shorty's most endearing traits was that he never met a stranger. He touched so many lives and did so in such a positive way. The hand he was dealt in life held different cards than most, but he played that hand so that winner took all. 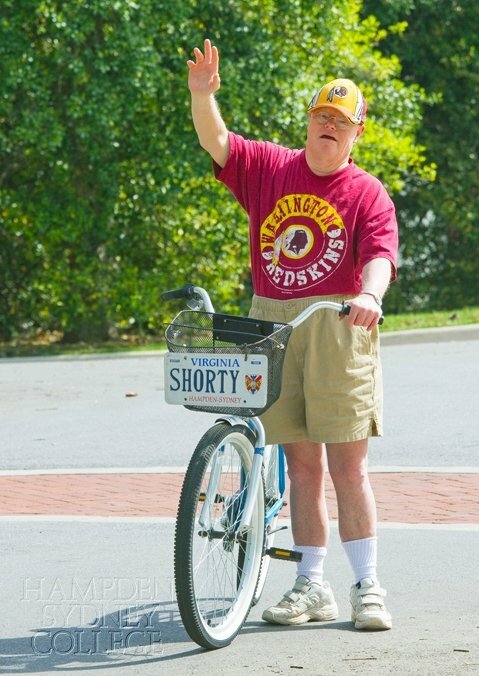 We should all strive to live and love as Shorty did every day. To steal one of his famous sayings, Shorty was without a doubt 'the best guy to come down the pike.'" A 2003 film eponymously named Shorty depicted the 2002 football season at Hampden-Sydney, during which Shorty was inducted into the College's athletic hall of fame. On the day of "The Game" against Randolph-Macon College—the final game of the regular season—Shorty celebrated his 56th birthday, a milestone all the more poignant in light of the 55-year life expectancy of individuals with Down syndrome at that time. The film's tagline was, "One simple wish. One extraordinary man." "This is a sad, sad day," said Davis Yake '08, the College's assistant director of athletics. "Though he's gone, Walter will never be forgotten. His memory will continue to live on as he made a lasting impression on every person in the Hampden-Sydney community over the last forty-plus years. Everyone who has met him has their own special Shorty story, but he gave more than humor and a great attitude; he showed endless joy and love to anyone he met and was truly a special man. I miss him already, and I know I speak for everyone when I say that he really was my 'best guy.'" "Win or lose, Shorty was unflinchingly loyal to Hampden-Sydney and to those who shared this campus with him," said President Larry Stimpert. "His life is a testament to the power of community. 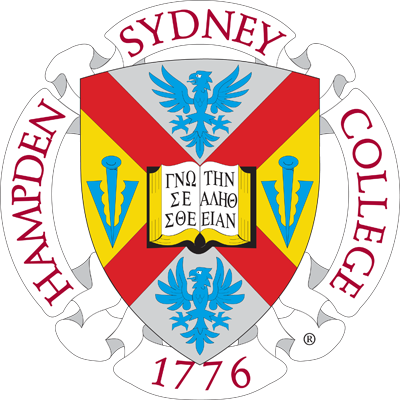 Hampden-Sydney's mission is to form good men and good citizens. On this campus and in our hearts, Walter 'Shorty' Simms epitomized both." A memorial service will be held at College Church on September 23 at 1 p.m. In lieu of flowers, the family suggests memorial contributions to the existing scholarship funds established in honor of Shorty, or to funds supporting H-SC athletic teams, such as the Gridiron or Roundball clubs.